As the world's first company to offer party tents and related event equipment available for purchase online, Celina Tent strives to create the most user friendly and informative sites possible. Celina embraces the idea of new technology and better methodologies to improve design, manufacturing, warehousing, distribution, customer service, training, and ecommerce experience. The Celina team has searched the world for quality materials, state of the art equipment, and improved processes so that we can bring you the best value. In a predominately old industry Celina Tent has established itself as a leader, with modern equipment, manufacturing capabilities, and software to make products quickly, efficiently, and cost effectively. At the Celina, Ohio manufacturing facility, Celina Tent's quality assurance lab that is capable of doing in-house testing on raw materials. 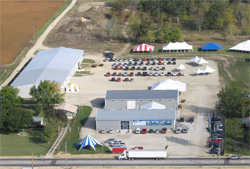 Celina Tent's 69,350 square foot manufacturing facility has the ability to produce more than 250,000 square feet of product per month. During the peak season, more than 30 LTL shipments leave the Celina Distribution facility per day. 1,000 complete tents along with 20,000 tables and chairs are stocked at this facility at any given time. The 100,000 square foot Distribution Center is located adjacent to the primary manufacturing facility. With large warehousing and consolidation capabilities, Celina Tent is able to fulfill most customer orders within 24 hours.